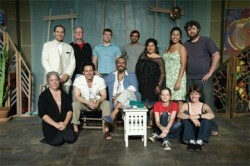 Pulitzer Prize-winning playwright Nilo Cruz’s Beauty of the Father makes its Midwest premiere. A drama infused with the sights and sounds of southern Spain, Beauty of the Father follows a young American woman who travels to Andalusia to meet her estranged father. While there, she becomes romantically involved with her father’s Moroccan companion. That love triangle provides the setting for an exploration of the conflict between love and sacrifice. Cecilie Keenan directs this production from the Latino-based Urban Theater Company. For tickets, schedule, and location, visit www.urbantheaterchicago.com.